As 2012 draws to a close, I am delighted to introduce a third CotM article by Birger Kamprath as December's highlighted species. Birger is an experienced Canadian catfish keeper with a distinct interest in African catfishes. For some people, that topic may start and stop with the numerous and frequently encountered species of Synodontis catfish, however Birger introduces a Congolese fish that is really rather different again. How would you imagine a stream in the Congo? Looking among the edge of the flowing water you would see thick trees and underbrush all around, branches overhanging into the flowing water. Aquatic plants in places, layers of leaves which have fallen and have now sunk to the bottom. With careful observation you see there is a fish perfectly suited, when still it could look like a tiny twig on a branch, among the leaf litter it could very well be a midrib on a leaf. When in motion it can crawl. What? Yes, I did say crawl, and it does this among the debris in its search for edibles. This month's feature fish does hail from the Congo and is suitable for this very real environment. Scientifically described in 1959 by Max Poll as Belonoglanis brieni it is a member of the little known family Amphiliidae, joining another, B. tenuis, which had been alone in the genus since 1902. Why is this fish so suitable? Having a slender delicate body combined with a maximum size of 50 mm (2") SL it can easily resemble a twig in shape. Having a yellowish to brown base colour, broken up throughout with darker brown would allow it to blend in among the foliage or sunken leaves. I did have both yellowish, lighter coloured and darker fish; seemingly identical otherwise, maybe it is a form of sexual dimorphism. Macro photos of the underside may show a difference but they are so delicate I did not want to handle them too much. Another good item for identification is the pattern of the hard plates on the top of the head, when compared with other Amphiliidae each species is individual. 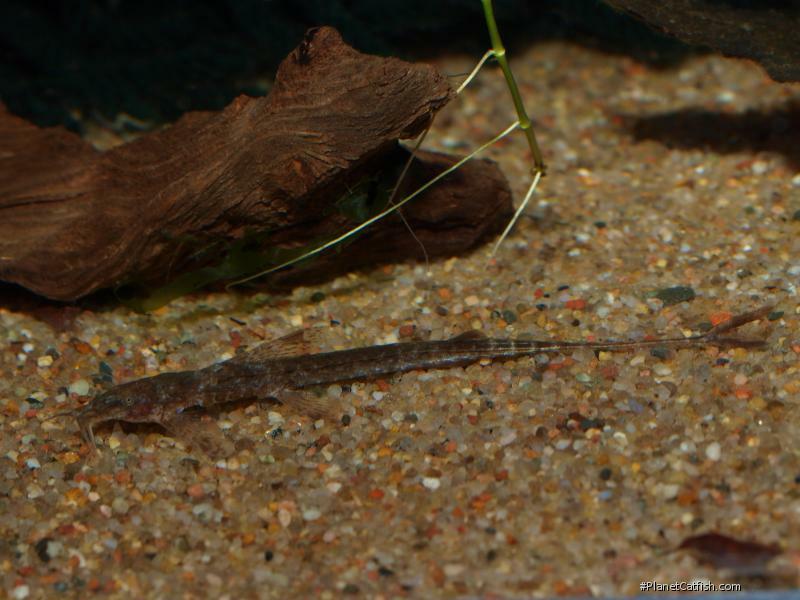 Like many of the so-called whiptails both African and South American, this fish has rows of scutes along the length of the body that are also in a pattern unique to the genus. Another feature of B. brieniis the rather large dorsal fin in comparison to other Amphiliids, this could be used to attract a mate among the leaf litter which is speculation on my part. A very interesting behaviour briefly mentioned in the introduction is being able to lift themselves up on their pelvic and ventral fins and "walking" using these appendages, stepping along quite adeptly even being able to back up if needed. I am presuming these walking whiptails forage among the leaf litter and debris along the rivers edge looking for food items. They must have adapted and now heavily rely on this behaviour as they are the most awkward of swimmers. Until we discover what these fish really like, feeding is most difficult, they are so thin it is difficult to assess if their bellies are full or not. I tried a few foods, getting the most movement when chopped bloodworm and live Walter worms were introduced. I am sure once settled other small live foods would be eaten. The Trachyglanis ineac that were mixed in with the group are definitely eating and are fat now in comparison to the Belonoglanis brieni. I do not keep a high flow rate in the tank which allows foods to settle where the fish can browse for it. Like most fish of the region I would think these are adaptable to water conditions. Keeping mine in conditioned tap water which has a ph of 7.8. Temperature of 23°C, there are no adverse affects during water changes. I have a few sticks, plants and stones for furniture along with a couple of spawning mops for extra cover. These fish do not usually seek out and hide under items but are often seen on top of rocks or the sunken spawning mops seemingly to rely on blending in as opposed to hiding. They are not overly active but are not shy to start foraging for goodies when it enters the water. Differences in the sexes and spawning information are unknown and currently I am just happy to keep these delicate little twigs alive. Tank mates for these fish would have to be the gentlest of fishes, the smallest of African characins or killifish. I do keep a healthy group of Cherry shrimp in the aquarium. My group came to me mixed together with Trachyglanis ineac and there does not seem to be a problem between the two, often seen sitting near or sometimes even on top of each other with no aggression that I have seen. I also have to note that the Trachyglanis do not utilize their ventral fins in the same way and are much better swimmers. I have just begun to touch on understanding these delicate little fish, if looking for a challenge look no farther than this little walking whiptail which we have so much yet to learn about. Identification On the top of the body there is a single row of bony plates from the dorsal fin to the caudal peduncle, paralleled by two rows of bony plates on the sides of the belly. Very long and thin caudal peduncle. Small adipose about halfway between the dorsal and the caudal, and a large dorsal fin. Apparently are toothless. Base color is yellowish to brown, is irregularly spotted with darker spots. Fins have a sprinkling of dark spots with brown on the caudal and adipose fins. General Remarks This species can raise itself on its pectoral and ventral fins and can use these fins in a walking motion. Feeding Very small insects and worms and crustaceans.